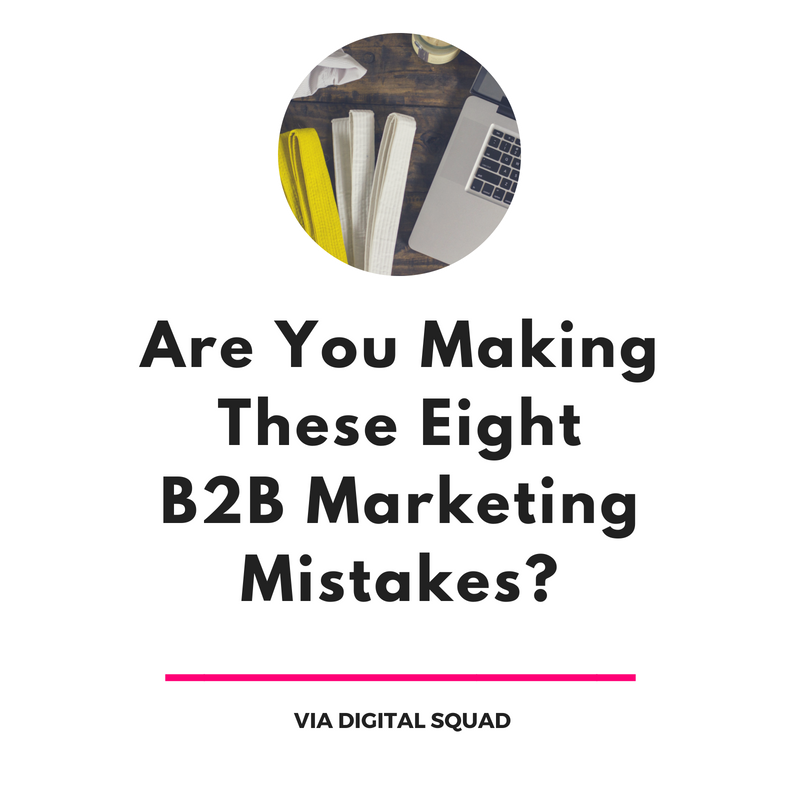 By Megan Okonsky B2B marketing, Content Marketing May 30, 2018 Comments Off on Are You Making These Eight B2B Marketing Mistakes? Your business doesn’t need us to tell you that B2B marketing has drastically changed with the digital age. B2B marketing has shifted from an outbound to an inbound strategy. Leads don’t come in the way that they used to, and conversion requires more than just a few phone calls and well-placed ads. Digital marketing teases lead generation and conversion as a “sit back and let the money roll in” process, but only if you have put in the work to strategically produce and distribute the right marketing materials. Inbound marketing can be a world of trial and error; that’s why we have A/B testing and other ways to statistically see what efforts are working for your company. Some B2B marketing mistakes, however, are ineffective no matter what audience you are trying to reach or how you generate leads. If your business is guilty of any of the following B2B marketing mistakes, it’s time to take a look at your overall marketing strategy and make some adjustments. We have mentioned in previous blog posts that only 37% of B2B marketers have documented strategies for their clients or business, even though strategies are an important way to maximise accountability, communication, and ROI. If you haven’t sat down with a team to discuss your B2B strategy, it’s time to schedule a meeting and grab a pen. Creating an effective strategy isn’t just about bouncing around ideas; it’s about creating and sharing a documented plan for your next campaign or quarter. This strategy shouldn’t be you be-all, end-all strategy for the year. Data, algorithm changes, and updates in technology will change your opportunities for lead generation. Do not limit your budget, content creation, or other tactics to what you know at the beginning of a campaign; create a B2B marketing strategy that is adaptive. Buyer personas are a fantastic tool for shaping your content marketing strategy and where you focus your marketing efforts in the first place. Keep buyer personas in your marketing strategy; when you create pieces of content for each step of the sales funnel, be sure to consult your buyer personas and ask yourself how your buyers will find and interact with this content. Ask information that fills in the missing pieces of your buyer persona puzzle, and use that information to invest further in generating leads that match those descriptions. Lead generation is important, but what happens after you’ve gathered a list of high-quality leads? These leads won’t boost revenue with just an email address or a single friendly interaction. When you are creating your B2B marketing strategy, think about how you are going to keep leads moving and optimise conversion rates. CRO should be a focus in your overall marketing strategy; without it, you’ll find your team stuck. Balance is a key element that should be integrated into every element of your planning. Any one step of the buyer’s journey or sales funnel shouldn’t be the sole focus of your overall strategy. Remember to create content and engage in tactics that lead your audience through each step of the buyer’s journey in a seamless, effective manner. In order to reach potential leads, you have to speak their language. The industry jargon that you know and use every day might be foreign to the people or businesses that need your help. If your website and your marketing materials are not accessible or easy to read for your audience, they will click away and find a business that they can understand. The best way to form your copy with appropriate language is to hold focus groups and conduct market research. Get some clients together and ask them what they believe their business needs to succeed. Record exact phrases and include that language in your copy. Future leads will relate more to these marketing materials and be more likely to trust that they can work with you. A positive user experience on your website is crucial for effective search engine optimisation and generating leads. A positive customer experience on the phone and in the office is crucial for boosting your overall reputation and creating loyal, supportive customers. These two experiences should not be separate events. If leads are taking the next step with your business and encounter a completely different experience, they may be confused or lose trust in your company. The best way to seamlessly integrate online and offline interactions is to educate your team about your digital marketing efforts. Use the same language that you are using on your website, and communicate the importance of your brand messages and values. A solid budget should be created and documented so each member of your team is aware of how much they can use and give away in order to boost conversions. A free trial or consultation can be the key to securing a lead’s attention and interest. If your team is hesitant about giving away these offers, however, you will lose the opportunity to express the value of your products to leads and potential customers. Include clear instructions for your team about giving away free offers and how this can be recorded. Part of creating an effective marketing strategy (for this campaign and future campaigns) is recording your efforts throughout the campaign process. One of the top challenges for marketers in the inbound age is calculating and recording ROI for different tactics. Tackle this challenge head on by recording the time and resources you use throughout your campaign. Your business has access to more data than you might think, and this data can help you target the right customers and bring them back to your website. If you haven’t integrated remarketing into your overall online strategy, for example, you could be missing out on the chance to reach people who have already shown an interest in your business. Use the data that you have available on Google Analytics, Google AdWords, and other websites that record how people behave on your website. How do you collect the most effective data? Check up on your marketing efforts constantly. See how users are responding to your ads, what keywords you are ranking for, and how website visitors move through your website. If you can catch and adjust problems on your website as they arise, you will be able to maximise leads and conversions at a faster rate. If past data is pointing to one tactic, but your leads aren’t responding as you’ve been told they would, it’s time to get creative. An effective marketing strategy is a balance between hard facts and creativity. Research and analytics that you find online may not always apply to your industry or your customers. Think outside of the box and try out new ideas for your content, design, and overall strategy. If you are getting creative, remember to test and record your results. A/B testing doesn’t require much effort, but can provide key insights about how your leads and website visitors are reacting to changes in your marketing efforts. An effective marketing strategy should be customised for your industry, audience, and goals for your next campaign. Create a strategy that meets your expectations for growth by partnering with a top digital agency in Auckland. Digital Squad offers a wide range of services that can help your business build and implement a comprehensive B2B marketing strategy. When we partner with a clients, we look at their buyer personas, current online rankings, and other elements to really tap into what makes their audience convert. With our expert knowledge in search engine optimisation to unbeatable results with AdWords marketing, we can offer the skills you business requires for a boost in lead generation and overall growth. Our team is dedicated to seeing each client succeed in the long run; we monitor keyword and AdWords rankings consistently and make the changes appropriate to keep moving in a positive direction. Reach out to one of the experts at Digital Squad today to learn more about how to improve your B2B marketing strategy.